In general, American Woodcocks are hard to find. They blend in well with surrounding foliage, and they stay low to the ground and move very little for much of the day. When they are found resting, however, they are good to birds for which to issue alerts, as they usually stay in place unless approached very closely. The Bryant Park woodcock of last March was a good example. It stayed in place for days, causing some to wonder if it was ill, and giving many birders (including me) an easy view of a life county bird. On Saturday, March 8, two American Woodcocks were found resting near some rotting logs in the area just to the east of Azalea Pond, an area where one had appeared later in the spring last year. These two lingered for another day, giving close views to dozens of birders. A more exciting find occurred the next day on Sunday, March 9. Peter Post, a longtime Manhattan birder, found a Red-necked Grebe lazily floating on the small area of open water near the Reservoir’s fountain and quickly alerted everyone on NYSBirds. There are no prior eBird records of this species in Central Park, and it may be the first occurrence of Red-necked Grebe there in forty years (according to Mr. Post). This bird is generally uncommon around the New York City area, but this year the freeze-over of the Great Lakes has driven many Red-necked Grebes further south in search of open water and made it temporarily abundant in some coastal spots. I had it off of Randall’s Island in late January, but it was distant and the view was unsatisfying. The grebe on the Reservoir was close and unmistakable. I am back to trading the markets every day, which is one reason my blog posts are fewer — I am doing a lot less birding. When an opportunity for a life Manhattan bird arises, though, I am always ready to spring into action. 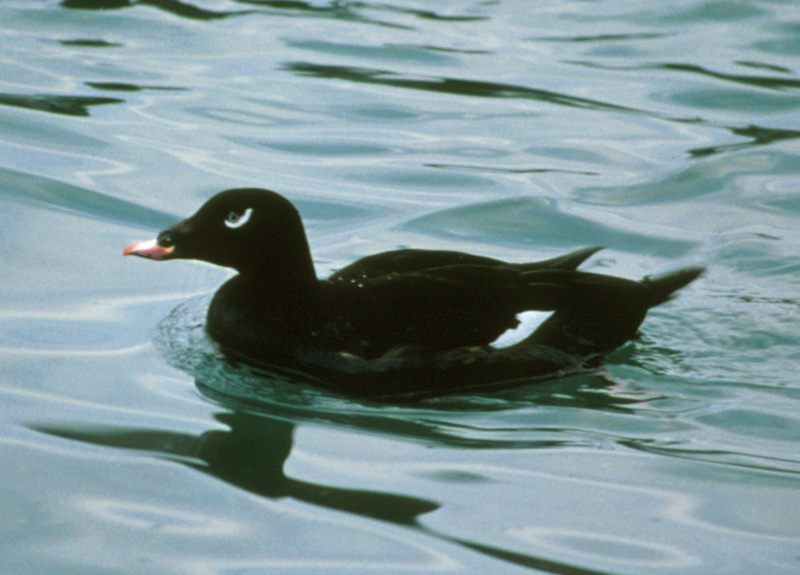 This morning at 9:27 ornithologist Joe DiCostanzo posted to eBirdsNYC that he had observed a drake White-winged Scoter flying west over the Spuyten Duyvil, just north of Inwood Hill Park. At 10:42 he posted that he had observed the scoter again, swimming on the Duyvil just east of the Henry Hudson bridge. I was 35 minutes late in reading his second message, but I had trades in progress and would not have been able to leave earlier anyway. Ducks tend to linger for the day, particularly in calm locations, so I was not too worried — particularly now that open (unfrozen) water remains relatively scarce. You may recall DiCostanzo from my book. He holds the lifetime record on eBird for most species in New York State: an amazing 404 from a New York birding career that began in the early 1970s. He gives birding walks in the Central Park Ramble every spring and fall through the American Museum of Natural History, and they are always in great demand. Sign up for them here. You will see (and hear) a huge variety of birds, learn something new, and have a fun time. You should also check out his blog, which he began today. I arrived at the east end of Inwood Hill Park at 1:15 p.m. I did not initially see any ducks on the water near the bridge, so I walked over to the newly-created Muscota Marsh where DiCostanzo had seen some Canvasbacks this morning, including a leucistic one. I was not seeing them, but I did see three Greater Scaup swimming together on the north side of the creek, which got me year bird number 69. I thought I would have a better view of the Spuyten Duyvil to the northwest, where the scoter was last seen, if I walked on a promontory that juts out toward it. So I did, and the drake White-winged Scoter, with its characteristic white comma behind each eye, came clearly into view. I later walked the trail that goes around the northern edge of the park and got a closeup look at the scoter from just east of the Henry Hudson bridge. I did not mind spending the extra time. I figured it probably would be years before I saw another. While walking back along the Dyckman ball fields after following the trail west and off of Inwood Hill, I saw a drake Canvasback land on the Hudson, only the second time I have observed this species in Manhattan. The White-winged Scoter was species number 237 on my lifetime Manhattan list.